A Timeless Treasure and Style Classic, our rings are always fit for any occasion. 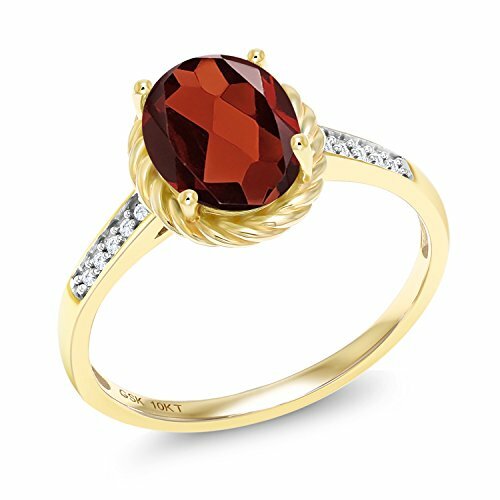 Beautifully crafted and designed our Garnet and Diamond ring is sure to win your way into her heart. This ring crafted in 10K Yellow Gold that adds a polished look to any ensemble and outfit. This ring is the perfect ring for engagements, weddings and all other occasions. As always with all of our products this item comes in packaging making it ready for gifting as soon as it is received.This beautiful item is brand new and comes with complimentary gift packaging appropriately selected to match the item you purchased. The packaging ranges from dainty foam insert packaging to luxurious leather insert cherry wood boxes. Every order is fully insured regardless of value. This insurance protects you against damage or the loss of your item while in transit. The Shipping and Handling fees include the insurance so there is no need to pay separately for insurance. VERSATILITY MEETS EXCLUSIVITY. This piece is so beautiful you won't want to take it off-and you won't need to due to its extreme versatility that makes it the perfect jewelry for all occasions.